A member of the Parx racing office said Friday the Bensalem, Penn., track is awaiting a few final calls back regarding next weekend's Grade 1 Pennsylvania Derby and Cotillion Stakes fields. Even if those don't result in additional entries, the 3-year-old features have shaped up strong. Both draw Monday ahead of race day on Saturday, Sept. 22. The Pennsylvania Derby, at 1 1/8 miles, represents final major race for sophomore colts before they go on to face older competition in the Breeders' Cup. The $1 million event has six probable and one possible. You can make a case for most all of them to win it. Axelrod is an improving Michael McCarthy trainee who got up to win the Indiana Derby (G3) and followed that with a commanding score in the local Penn Derby prep, the Smarty Jones (G3). Bravazo has showed up at every call. Along with Justify, he's the only horse to run in all three legs of the Triple Crown. Unlike Justify, he also went on to contend in the Haskell (G1) and Travers Stakes (G1). Hofburg missed the Travers due to a fever but remains on schedule to reappear here. He's not longer lightly raced and experienced. Now he's eligible to step forward off a win in the Curlin Stakes (G3). Instilled Regard moved from trainer Jerry Hollendorfer to Chad Brown following a fourth-place finish in the Kentucky Derby as the longest shot on the board. He's a bit of a question mark ending the layoff here. 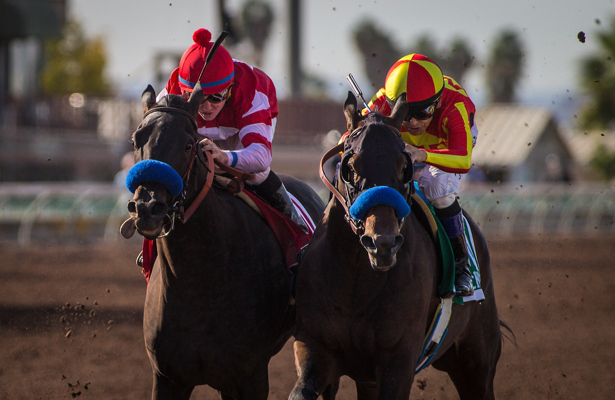 McKinzie, trainer Bob Baffert's best Derby hopeful before Justify came along, has trained steadily for the Penn Derby, a race the Hall of Famer nabbed last year with eventual 3-year-old champion West Coast. Mr Freeze is "on the fence," still only termed possible to run following his eight-length score in the West Virginia Derby (G3). Trainer Dale Romans has remained patient with this one, who didn't debut until April but appears to have a high ceiling. Trigger Warning just missed on the front end of the Indiana Derby, then took a major step up in the Travers. He never gets respect in the wagering and came in sixth at 79-1. As for the Cotillion, also worth $1 million, a highly anticipated rematch between Kentucky Oaks 1-2 of Monomoy Girl and Wonder Gadot is on. They'll be joined by a few other top fillies. Chocolate Martini: Fifth in the Kentucky Oaks, she has since traveled for a West Coast start and run at Saratoga. The former claimer has a nice habit of cashing checks. Dixie Serenade: The local runner won Belmont Park's Victory Ride (G3) back in July and was second by a head back at Parx in August. Midnight Bisou: Once considered the main division threat to Monomoy Girl, she will route again after second in the Coaching Club American Oaks (G1) and third in the Alabama (G1) at Saratoga. Monomoy Girl: The Brad Cox trainee is on a historic tear of four straight Grade 1 victories at as many tracks. With a win here and in the Breeders' Cup Distaff, she may garner Horse of the Year consideration. Wonder Gadot: A try at the Travers didn't work out, but back against the girls, and with the addition of blinkers, the Queen's Plate winner may be eligible for some revenge after beaten just a half length in the Kentucky Oaks.